Ryan Reynolds has put aside his recent feud with Hugh Jackman to offer The Greatest Showman star help on his upcoming world tour. 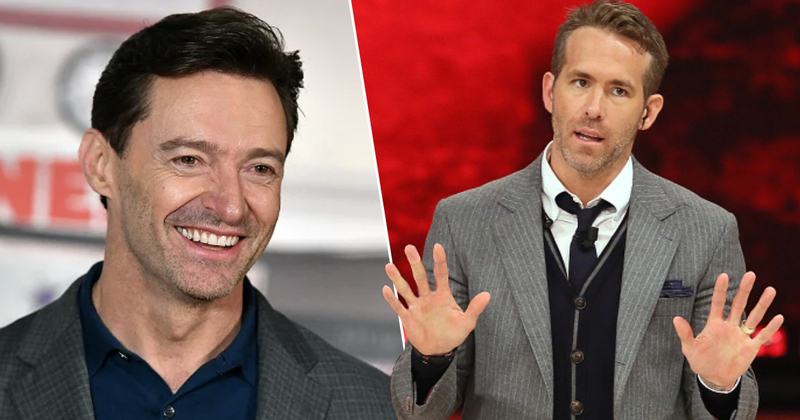 Hugh (I’ve met him, so calling him Hugh’s fine) told the Today Show, as per Metro, that Ryan (haven’t met him but think we’d vibe) has offered to make a guest appearance when the former Wolverine actor hits the road next year. Unfortunately for Ryan, it seems that Hugh wasn’t willing to let bygones be bygones and refused to let his arch-internet enemy come with him. To rub salt in the wound it appears that Ryan’s one of the few people that Hugh’s not invited on this tour. In a recent interview with Extra Hugh confessed that he’d love P!nk, and her daughter Willow, to come along and sing ‘A Million Dreams’. But wait there’s more! He wants Sting to come as well along with, Janelle Monáe, Audra McDonald, and Kelly Clarkson. In fact, he’s admitted ‘there are so many people that I would love to come’. Ryan and Hugh’s feud has been a highlight of 2018 (which should tell you how sh*t this year’s been), delighting fans who love the succulent taste of fake celebrity beef. It all began last year when Hugh retired from the role that made him an icon, Wolverine, outraging Ryan who’d finally got his pet project Deadpool off the ground. Since then Ryan’s spent the last 12 months or so desperately trolling Hugh at every opportunity in a hopeless attempt to get him to pop his claws again. Hugh, for his part, responded the way all grown-ups do when a petulant child throws their toys out of the pram. He’s ignored, Ryan. Or at least that’s what he was doing. Over the last six months, Hugh seems to have gotten some real pleasure out of telling everybody and anybody that he will never play Wolverine again. Hugh has remained defiant though, saying despite Ryan Reynold’s insistence he was completely done with the character. Although he does recognise the character will return, he just won’t be playing him. Even Ryan’s started to realise that Hugh’s done with Wolverine, admitting that while he knows he won’t convince him he won’t stop pestering him. I think convincing Hugh of that would be a near-impossible feat, but there’s no human being I love more than Hugh Jackman in that universe, and equally so as a friend. He’s just the best. I already miss him as Logan, so I’m one of those guys that whenever I see him, I’m like, ‘Come on, man. Just one more. Come on. We’ll do it together. It’ll be fun. Come on! On three. Here we go, together. One, two, three, together,’ and it’s always just me saying it. Maybe 2019 will be your year Ryan? Tickets for Hugh Jackman Live! are on sale now.